Auto, Boat, RV, and Motorcycle Insurance Available. Home, Condo, Rental, and Earthquake Insurance Available. Individual & Group Disability Insurance Available. Individual & Group Insurance Available. 5% National Discount! Up to 80% Reimbursement, Multiple Pet Discounts Available. 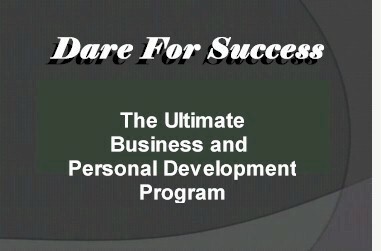 Dare For Success is one of the most effective marketing resources today. We help local businesses find new business opportunities via our membership coop and our free marketing network where members can interact with other business owners in their community to share business information, resources, marketing assistance and advertising opportunities. We have developed a dynamic business networking group where each member has an opportunity to grow his or her business whether it's by gaining new business through referrals from other members or simply through the valuable exchange of experiences from other business owners. .
Our concept is simple and has a basic premise. Regardless of the type of business you own, large or small. It could be a small home based business with only you as the single employee or a major corporation with hundreds of employees. We all have one thing in common; we are all consumers in some form or another. We all buy food, clothing and we need transportation and a roof over our heads. We all pay for the little goodies that we want in life, we also go on vacations, and we buy stuff that we just can't live without...We are all consumers. As consumers most of us look for the best deal we can get on whatever it is that we want. In most cases we shop around till we find the best deal. With the advent of the Internet shopping from home has become the easiest and most effective way to find the stuff we want. The biggest problem we find now days is the information overload when we search for that great deal. Not to mention that we now have to be careful who we deal with via the world wide web. Is the company trustworthy? Do they take credit cards? Will I risk providing important financial data to the wrong person? All worthy concerns. Independent locally-owned businesses are essential to a vital local economy. They use the goods and services of other local businesses, serve as community hubs, and are vital components of healthy neighborhoods and strong city centers. They're where the locals go. They're owned by our friends and neighbors, or maybe even by you. Dare For Success is dedicated to helping communities and independent businesses to thrive. We work closely with local business owners to offer training, motivation and we show business owners the best way to provide great deals on products and services to their local communities. Many of us are bombarded weekly and in some cases daily with flyers, emails, faxes, phone calls, handbills stuck under our windshield wipers and of course the traditional forms of advertising TV, Radio, and Newspapers. We won't even mention the multitude of emails, banner ads, popups, popunders, popovers, click throughs, and such found on the Internet. We have all become product numb from all the advertising we see and hear every day. Dare For Success encourages citizen engagement in community social, cultural and economic well being by involving them with the backbone of the community, their local businesses. When local business thrives, communities thrive. Our goal is to assist each and every business owner member with as many resources as we can find to help make them as successful as possible. Our staff is constantly looking for information, products, and services and of course more great business owners like you. We know that great people like yourself can bring your resources to help other business owners too. We are a community of people helping people and businesses helping businesses. We strive to make a difference every day.